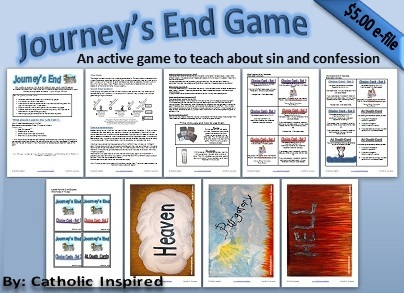 An active game to teach about sin and the need for confession. Are you looking for a fun way to teach kids about sin and the need for Confession? Well I've created a new game to help teach the effects of venial sin, mortal sin, and Confession. It's not a board game, but an active game where the kids walk along the "Life Path" and follow what the cards tell them to do. Along the way they can help the souls in Purgatory. Then at the end of the "Life Path" (at death) they see if their actions on the "life path" are actions that send them to Heaven, Purgatory, or Hell. This is a game that I created (with some help from my loving hubby) to teach our kids about sin and confession. Our kids loved it. So I shared it with our local homeschool group. The parents and their kids loved it, too. It's a game designed for 2nd graders and up. Even the homeschooled teens enjoyed this activity! Younger children played, too, but needed assistance. Every one of the kids, young and old, wanted to play this game again and again! It's a perfect game for those who are receiving their First Penance and First Holy Communion, any RE class, youth group, or fun party, like an All Saints Day Party! So I want to share this fun game as a printable e-file for purchase. 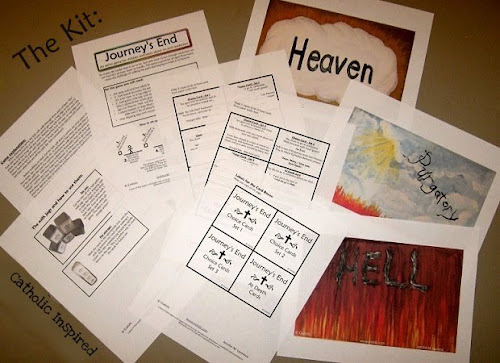 This E-file comes with the instructions, cards, and the signs for heaven, hell, and purgatory. You need to supply the "Life Path" which could be 3 - 2x4 boards or painters tape, and 2 carry bags with 5 lb. of dried beans, sugar, or any other dry 5 lb. item in each . Also, the bottoms of 5 half gallon milk jugs are used to hold the cards, but this is optional. 1. How many kids can play at a time? It can be as many kids as you like, but this game works better in larger groups. The players are all independent players. Only the "souls" in purgatory need the help of the other players. The home school group I did this game with was about 40 kids of all ages! If you have a helper at each card area. (About 4 helpers) You can have about 6-8 kids physicality playing at one time. If it's just one person in charge, the number of kids on the "life path" will need to be less depending on that persons ability to manage them. A group of young teens should be able to do this with only one teacher/parent. 2. About how long does the game last? It can be as long or as short as you like! For each child the game will only last a few minutes, but the fun is in replaying and trying again! If it's a large group of kids, they can line up at one end of the game's "life path" and when it's their turn they play the game. Then they get back in line to play again! If the line of kids waiting to play can stand beside the "Life Path" it can be fun so the other kids can cheer on those playing! It's kinda a fast moving game. 3. If the moms help the smaller ones, is it a game they could play? Yes, but you may need to make their "journey" a little easier than the card says. Kids younger than 7 don't seem to understand the concept as well, it's just a fun game to many of them!